The biggest UFC fight of the season between Khabib and McGregor is just days away now and its high time that you start exploring your options to watch this event live. And the best way to watch UFC 229 live online and other upcoming UFC events on a big screen and in HD quality is to stream it live through your Firestick device! So presenting you with some incredible options for official channels for UFC streaming on Firestick, how to get the fight pass at much cheaper rates through a Best VPN, fight info and much more, here is our comprehensive guide on how to watch UFC on Firestick! Firestick is perhaps the best streaming device by a distance, as it not just allows you to stream content on your TV or LCD in HD quality, thereby enhancing the experience, but it also has loads of other incredible options like better compatibility with different apps, more channel offerings and a whole lot more! But leaving aside Firestick for a moment, for watching UFC 229, first, you need to get the fight pass. The Fight pass is basically a fancy name for the subscription plans available at UFC TV, which is UFC’s official streaming channel. Monthly UFC Fight pass: $9.99. 6 Month UFC Fight pass: $8.99/month. 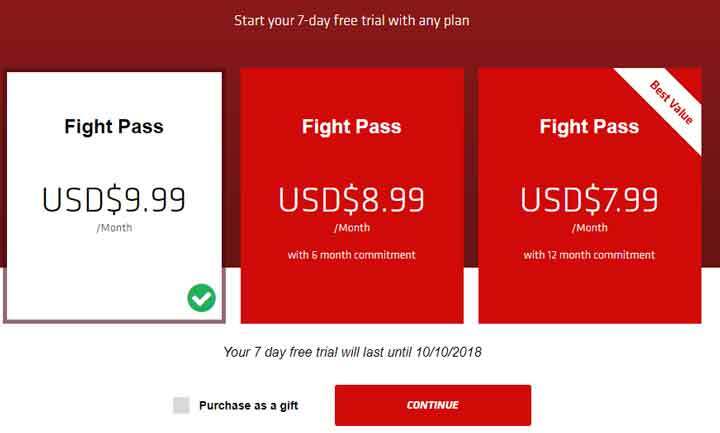 12 Month UFC Fight pass: $7.99/month. The prices for the fight pass, as well as the plans themselves, have changed considerably over the past few months. The yearly plan being offered right now didn’t exist in the previous pricing plan strategy and neither did the monthly pass. All you had in there previously was a one-time fight pass to each particular event, along with a 6-month plan. But now, the monthly and the yearly plan comes as a relief for enthusiastic fans of UFC, as it allows them to get much more streamlined access to UFC.TV. I found the one-time Fight pass to be something incredibly stupid and it’s a relief that UFC has finally done away with it. The pricing plans are much better suited to user needs now definitely, but do you want the same plans at much cheaper rates? Yes, that might sound a bit unbelievable but it can definitely be done! Well, it goes like this, UFC Fight Pass is a geo-restricted aspect of the UFC service, which means that the prices of the plans available on the Fight pass vary from vary region. The prices mentioned above are the ones offered to US audiences, but if you look around enough, the prices do get lower. Note: I used the Best VPN to connect to different locations across the world and according to my analysis, the prices offered for the Fight pass plans are the lowest in the Philippines. Monthly UFC Fight pass: $8.47. 6 Month UFC Fight pass: $7.64/month. 12 Month UFC Fight pass: $6.78/month. The differences between the prices at both places are exceedingly evident here. In the Philippines, the yearly plan costs at least $1 ½ less than that in the US. 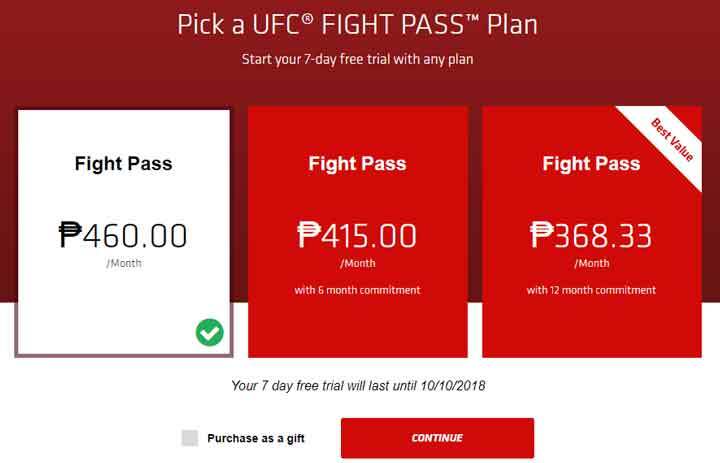 So if you connect to the Philippines server through a Best VPN and buy the fight pass plan, then you are in for a pretty good deal. Launch your Firestick/FireTV device and head over to the Apps section. 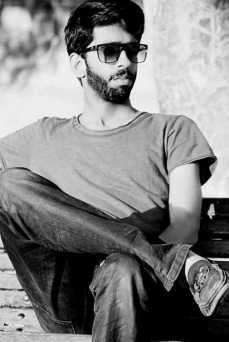 Here, search for UFC and select “Get” to commence with the download and installation process. Once the installation is complete, enter your Fight pass details. You can now watch UFC on Firestick in HD quality any time you want! While UFC TV is an official and paid option for watching UFC on Firestick, you can even access UFC streams for absolutely Free through MatchTV.ru. A popular Russian service, MatchTV.ru will be streaming the UFC 229 event live on its service and the best part about is that, you don’t need to sign up or pay for anything to access it. 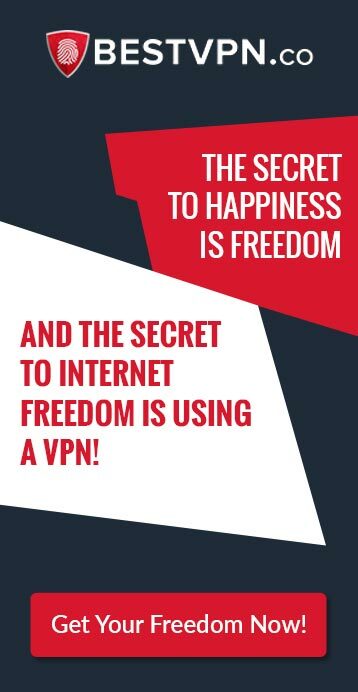 Download and install official VPN app from Firestick app store. Connect to a Russian server and use the official Amazon Silk Browser to visit MatchTV.ru. Enjoy Khabib vs McGregor for UFC 229 live on your Firestick for Free. While Firestick is a great option to stream the Khabib vs McGregor fight without cable, the device is a bit restrictive when it comes to the channels offering live streams for UFC as compared to those available through the cord-cutting option. 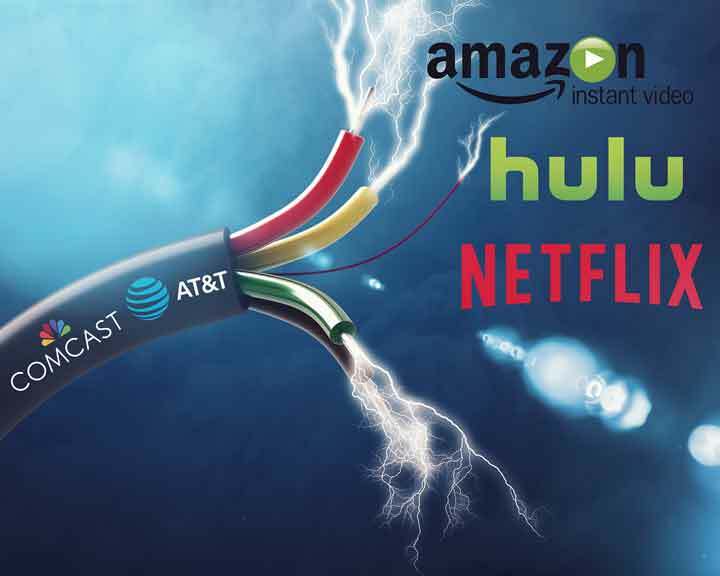 Without cable is a growing phenomenon all across the world of entertainment as it offers some of the most comprehensive OTT streaming services which include things like hundreds of Best TV channels, DVR cloud storage, multiple screens among others! If you want to know more about this, then you definitely need to read my guide on how to watch UFC without cable consisting of many more streaming avenues than other niche platforms like Firestick. With the high legion of streaming devices and software available to users in today’s world, its become increasingly necessary for us to provide for and facilitate my users with as many dedicated guides as I can that offer the best streaming solutions for every event. And I have done the same for the Khabib vs McGregor fight in the TFC 229 event. Here is a list of all such devices that are the best alternatives to streaming Khabib vs McGregor on a Firestick! Khabib, the Russian lightweight reigning champion is the star favorite for winning this fight with the notorious Irishman Conor McGregor, but will the duel between these two turns out to play true to the odds or will it spring us all up with an incredible surprise leaving all of us stunned? This is going to be one hell of a fight and you should not miss out on it or your will keep regretting it. The guide here provides multiple options for you to watch McGregor vs Khabib live on your Firestick so deploy them and catch the biggest fight of the season unfold live on Oct 6, 2018, at the T Mobile Arena in Paradise, Nevada! Get – Set – Finish Him!